El Clasico coming up this sunday!! Not the same excitement with the league winners already decided. I think the Spanish FA got it wrong this time with their schedule. I will be supporting Real only because how Barca operated in the transfer market with Coutinho and Dembele. Hope to see a good game. I am however sweating about the liverpool Chelsea game this sunday!! I just hope we draw the game and qualify for CL . But won't it boost Real up for CL final? I thought you're an LFC fan. Real are always ready for Champions League. Champions League is in their DNA. Liverpool build and developed coutinho for the past 5 years, they had no reason to sell either since money is no longer an issue for most English clubs (given the TV money). So it was really bad how Barcelona approached behind the back to get the Coutinho deal done. Plus the barca presidents are known for their under the table deals and some of them are actually in prison now. LFC didn't seem to play good at all against the Chelsea game. I only watched the highlights, so not sure. I hope they put up a good show in the UCL final although it will be hard to beat RM. You are right. LFC did not play well. I was not expecting them to play well either. This was their 9th game in the past 30 days. When you consider the size of LFC squad, this is hard for the team. They now literally have 11 players for 11 positions. Absolutely no one left on the sub bench who are first team material. Joe Gomez, Emre, Ox, Lallana are all injured. However that being said, LFC play their best when they can gegenpress and they can only do that when they are fit enough to run the distance . With atleast a week gap for the next games, I expect LFC to play better. 2 big finals in next 2 Sat. . Among the big teams, both Brazil and France announced their 23-men squad for 2018 Fifa WC. Brazil looks like a balanced team considering Neymar comes back all healthy and wise. Since Italy is out, I won't mind seeing either Messi or Ronaldo lifting the trophy this time, however both are very unlikely. I would love England to win but that aint happening. Belgium, Iceland and so on don't stand a chance to win the WC. Argentina is great going forward, but their Defense including Defensive mid is absolute garbage... Mascherano is still their best CDM.. ... 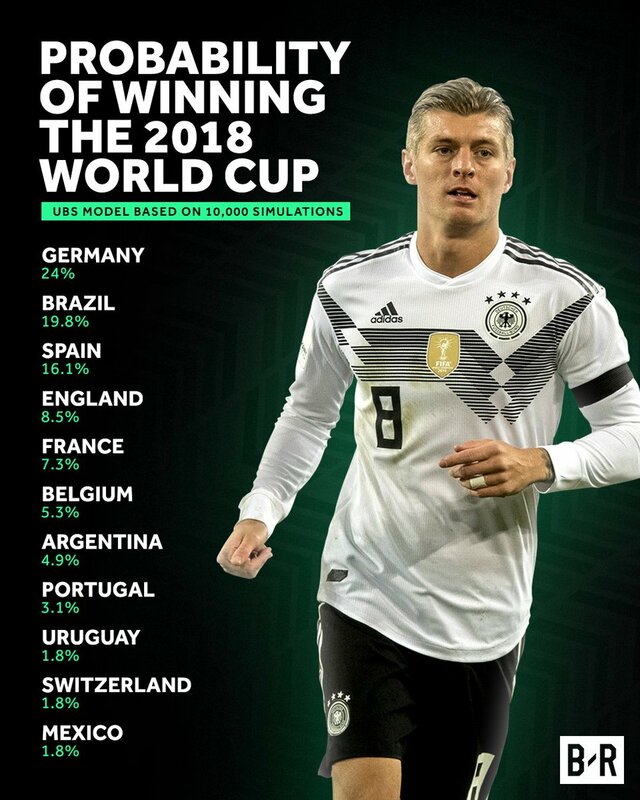 They almost did not qualify for the WC and there is a good reason for it. Portugal has 2 awesome players in Ronaldo and Gelson Martins. The rest are between average and good. I am actually looking forward to see how Belgium performs. Would be nice if they can take the cup home ( highly doubt). Tired of seeing Brazil and Germany lifting the cup every time. Want a new team to win it. Tunisia somehow always make the cut. Hazard is not overrated... He plays when he feels like with Chelsea... Watch the match against Liverpool.. There is also Naingollan (best in Serie A), Toby Alderweirald (One of the best D in EPL), Vertonghen. Also Kompany is still one of the best, his problem is injury. Agree with this. I would actually put Spain in Tier 1 too. They have a phenomenal team this time. Belgium, Iceland, England all same category. Don't think they will fare well this World Cup. There's lot less media hype around the England team compared to previous WC. Young team, has some quality players. Looking forward to seeing the trio Kane/Vardy/Stirling start up front. Where is Australia in this tier nomenclature of yours? There is always media hype around England and they always fail because of lack of team unity. That is what worries me. English players are unique in the sense that they put club over country. This is what makes EPL so great and English NT so bad. If England could not do anything with Gerrard Scholes Lampard , I am not sure if they can do a lot with Loftus Cheek and Henderson!! Team unity is what is needed. Argentine goalkeeper Sergio Romero has been ruled out of the World Cup with a knee injury. A big blow to an already-weakened ARG side. Nahuel Guzman has been called into the squad as Romero's replacement. Chelsea's Willy Caballero, with only two caps, will most likely be in the starting 11. How many guys from th last world cup will not make it in this world cup? Is That guy from Africa, Drogba, still playing? I think he only played for Ivory Coast (Côte d'Ivoire). I believe he retired from national appearances. Nevertheless, Ivory Coast didn't qualify for 2018 WC.